Marriage is not for the faint of heart, and your wedding rings should be a testament to your romantic commitment. Show off your fearlessness with our couple titanium Koa wood matching rings. Each pair we offer is inlaid with striking and exotic Hawaiian Koa wood. In Hawaii, the word “koa” means “warrior,” which is perfect for celebrating your union in a sustainable way. Each of our titanium and Koa wood couple wedding bands is utterly unique. Titanium is lightweight and easy to wear. Titanium will also resist corrosion and tarnish for years to come. Best of all, titanium is biocompatible and safe to wear for people with skin sensitivities. The polished finish will shine brightly on your wedding day and every day thereafter because titanium does not lose its shine. At such an affordable price, you can save big on your wedding bands and expand the budget on other elements of the big day. 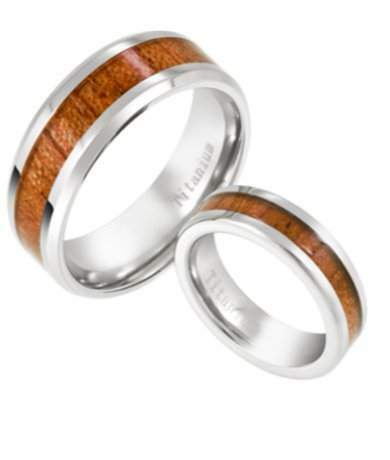 Our couple titanium Koa wood matching rings are peerless in sophistication and style. Many modern couples prefer the look of white gold or platinum, but those precious metals come at a substantial cost. Titanium offers a glamorous gunmetal hue that looks positively radiant when contrasted with Koa wood. Our titanium and Koa wood couple wedding bands are crafted in the comfort fit style. Comfort fit rings usually measure a half size smaller than traditional and standard rings, because of the extra metal used to create a domed interior. We recommend that you have your finger measured for accuracy and to determine whether a comfort fit ring is right for you and your lifestyle. If you have any questions about this product, please contact one of the JustMensRings.com representatives today for more information or further assistance. I bought this ring as a wedding band for my husband and it is absolutely stunning! The wood was slightly lighter than the picture but much more vibrant and realistic looking. The comfort fit feature is fantastic and he says it's the most comfortable ring he's ever worn. He loves the wood inlay and won't stop telling me how shiny it is! Fantastic quality ring for the price! This ring is wonderful, my fiance and I have had a really hard time finding a ring in his size as he wears a size 17. It's not the exact metal we want him to wear because he works with his hands everyday for work. JMR has a great selection of rings, and the designs on their tungsten rings are terrific but most of the don't come in a size 17. I bought the matching set for myself and my wife and she said they are beautiful rings and have good quality for the price. I highly recommend them to anybody. Great ring. Great price. I bought this ring to replace a damaged wedding ring. I got my old ring back yesterday and don't want to change it out. Nice ring. Very comfortable fit.